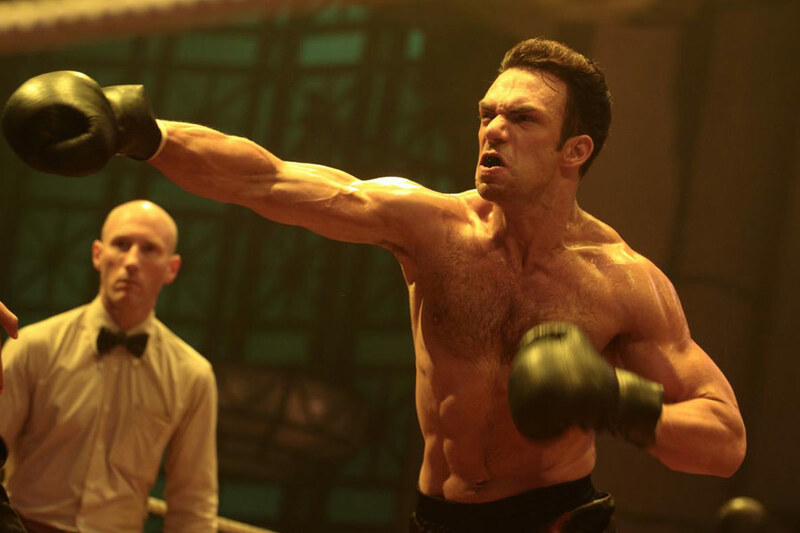 Stockport born and raised Darren Shahlavi has been a stunt man, bodyguard and is now a martial arts action star working all over the world. Star of Ip Man 2 & Mortal Combat. He started his training at the age of 7. He travelled to Hong Kong where he began his movie career, mostly as an actor, stunt double and later as a villain in the early 1990s. Later he made the step from Hong Kong to Western cinema. His resume is growing and now he has had the opportunity to be a good guy. Besides being an actor, he was also a bodyguard for some of Hollywood's greatest stars, such as Patrick Stewart and Bruce Willis. You started training when you were 7 years old, was that your father’s influence? Yes, my brother wanted to go to judo with one of his mates, so my dad would take him over to judo, and he’d come back and he’s had so much fun – and you’re at that age and you have so much energy, this was before I knew martial arts or Bruce Lee, but my brother and his friend came home and they loved it, so I said I’d like to go as well. So I went along there and it took place in Marple Ridge School and it was in a drama room. So sometimes if we got there early I would see the actors rehearsing their stuff, and they were getting ready for their show, rehearsing in costume and stuff, once the actors left the stage we’d put the mats down and do judo. So once I became aware of martial arts movies the two came together, I kind of knew then that I wanted to be an actor that did martial arts. So my first experience of learning martial arts was in a drama hall, the two of them just came together, it’s never left me. Your first film experience was in 1991? Was that your first professional experience or had you done some stuff on camera before? No, that was my first time. Bey Logan, he was a martial artist and writer on Combat Magazine, the first guy to interview Steven Segal and Jean Claude Van Damme. Well I sent him my stuff - I was about 15 years old. I managed to get his number and call him up. I told him I was going to be an action star. He said ‘how old are you?’ I said 15 and he said ‘do you look it?’ I said yeah so he said ‘are you shaving yet?’ So I said no – but I’m working on it! He said ‘Are you good looking?’ i said well the girls think so! Anyway, he listened to me and about a year or two later he was a line producer on a Hong Kong movie being made in the UK, he called me up and asked me if I’d like to be his assistant – ‘come to Birmingham and London to help me – you won’t get paid but you’ll start to learn the ropes’. So I went down. So in a way – the guy that’s playing Ip Man – the man that was a teacher and such an inspiration for Bruce Lee – was your Ip Man – your inspiration – and here you are in a movie with him. Life imitating art. There’s something like an omen there Darren. You know they took me on a press tour in China when the movie opened and we did all the major cities in China and the Chinese Press were so interested in me being a westerner and so interested in Bruce Lee. I thought about that and realised that if it had not been for the real Ip Man being such an influence on Bruce Lee and Bruce’s influence on the whole world and me, I owe Ip Man so much, because of him I have a career and the life that I have now, all this directly through his relationship with Bruce Lee. You’ve worked in both Hollywood and Hong Kong film industries, what are the stand out differences in film making styles? Number one, in Asia, you’re talking about people like Donnie Yen, Sammo Hung and director of Ip Man Wilson Yip. The fight scenes that they do, it’s their career so it’s very important that they have the time to do the fight sequences they want to do. The time and the talent to be able to create better fight scenes and do better than their previous movies. Sammo Hung comes onto a movie set like no one I have ever seen before. He knows exactly where to place the camera, how to move it, what lenses, lighting, angles to use and never once have I heard him say ‘you know what, this doesn’t work, let’s change it’ - never, he knows what he wants before he gets there and he gets it. In America they just move the camera around, shakey cam, chop it up in the edit, it never looks as good as the Hong Kong style. In Hong Kong the film making comes from the stage, from Peking Opera. So you would sit there in an audience and see the whole stage. I say to American directors that I work with ‘If you were doing West Side Story now or if you were going to do ‘Fiddler On The Roof’ – anything on stage – why would you zoom in to a head and shoulder shot – when you have all this great dancing and choreography going on all over the stage?’ Because that’s how martial arts scenes are shot in Hong Kong, like it’s a dance, a very carefully choreographed dance that fills the frame, it’s important to show all the moves and the different techniques employed by the fighters. It’s crazy to bring in all these martial artists and stunt guys filling the background and all you’re filming is a close up or a head and shoulders shot? It just doesn’t make sense to me. In Hong Kong they know how to do it because it comes from a staged idea. Sammo on Ip Man 2 went in tighter than he normally does but with the sound effects and everything you really feel like you’re in the ring with those guys. So the main difference is that in Asia we have time to do the fight scenes. An example. 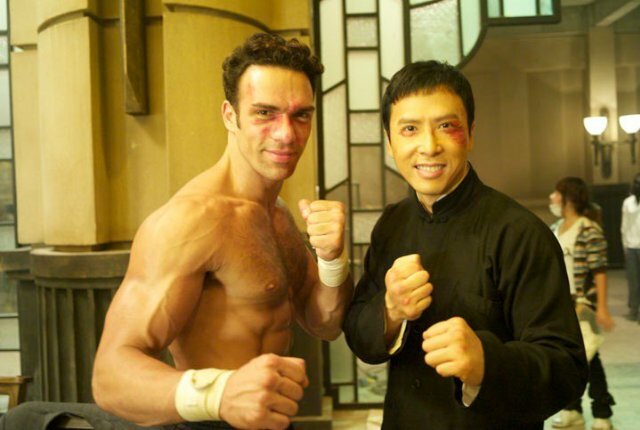 We go from doing the end scene in Ip Man 2 between Donnie and me, which took 10 days to film – after that movie I flew to Romania and did a movie with Steven Segal called Born To Raise Hell and we had two hours to do the end fight scene. Yeah, I go from Hong Kong where we get 10 days to craft the scene and then I play the main bad guy against Steven Segal and they give us two hours to film our final confrontation – ridiculous. Yeah, they know how to do it the right way over there. Your career as a body guard with the likes of Bruce Willis and Patrick Stewart, what were those experiences like? They were fun! This is when I was in Hong Kong, I was 20 years old, I had my 21st birthday there and I got to work on movies. But when I wasn’t making any money I hooked up with this company, this girl I was close friends with ran it, it was a security company and she got me work as a doorman. These weren’t clubs where all the local Chinese people go, these were clubs where all the tourists go, I ended up working the clubs and we’d do events – I did security for Phil Collins when he was touring there, John McEnroe when he was doing exhibition matches. Well I got a call saying Patrick Stewart wanted to meet me, he wanted a body guard but he didn’t want someone that was big and looked like a bodyguard, he wanted someone that looked like a business associate. So I spent four days with Patrick Stewart, round Planet Hollywood and such while he was doing interviews to promote the Star Trek movie. Yeah it was great, I’d cover Planet Hollywood and Bruce Willis was there doing publicity for Die Hard 3, other stars were Jackie Chan, Cindy Crawford – the pay was lousy – but they knew it was a good fun job for us, you see in Hong Kong the crowds there are much more respectful of the actors or celebrities – the difference in America being people want to rush up, invade their personal spaces and such, that can be dangerous obviously. It was there that I was called up and hired as the main bad guy in Tai Chi Boxer, the film that really started my career over there. So yeah, working for the security company was a lot of fun and a good way to supplement my income, so I’d have enough money to go and meet directors and get my photographs and all my stuff out there. You seem to be hitting the bad guy roles at the moment, are you enjoying that? Yeah I am, bad guys are always a lot more fun to play. My first starring role was in a movie called Aladdin: Curse of The Djinn, I play Aladdin, a more mature version where the genie is an evil genie and I’ve got to get him back in the lamp and send him back to hell, it’s going to be in cinema’s in April. I’ve recently played a bad guy myself in a move that’s come out over here called Diary of a Bad Lad. I saw the artwork for that yesterday! That’s me on the cover. No way! Is it on Net Flix? I think it could be, it’s all over the place at the moment – mainly on illegal downloads! It’s an interesting movie, you think you’re watching a documentary, it’s very cleverly done. Did you have any dangerous moments as a body guard? Not as a body guard, more as a doorman. I was working this club that had a lot of trouble. Not just trouble in the club, but trouble keeping doormen, they’d work one night then not come back. The main problem was westerners were causing the trouble, getting drunk and starting fights, so I went in there and decided to take a different approach. All the people that were causing trouble in there, I befriended them, I think it might have been because I was from Manchester as some of them were from that area, we related to each other and I called them out and just said ‘Listen lads, stop messing about, be nice to me and I’ll be nice to you, I’ll get you into the club, I’ll get you a seat, I’ll get you in for free I’ll get you drinks, I’ll help you out, but you have to help me out too. So now friends with the guys that were causing trouble, so if any others came in and started trouble, these guys said they’d watch my back. I’d approach trouble makers and these guys would surround me, all on my side, brains over brawn, and any potential trouble was snuffed out. I took care of them and they took care of me, so in a sense, I learned how to be a bad guy on screen by watching those bad guys in the club, by being in situations where a guy pulls a knife out on me. I freaked out, grabbed him, slapped him – I learned – I mean, to be honest I was scared, but I dealt with it. I mean there were a lot of situations where I was on my own having to deal with dangerous situations, I learned how to be a bad guy to get what I needed, to look like a dangerous psycho to save my bacon a few times by acting. So I learned how to act as a bad guy specifically from being on the door, it helped in my career as an actor. It comes across man, you have a great screen presence as a bad guy, particularly in Ip Man 2, I thought it was a great performance. You did a commercial with Jackie Chan in Taiwan? Yeah for this drink that I thought was a beer but turned out to be an energy drink. It was fun, he’d just finished doing Rumble in the Bronx, it was a funny commercial. It was supposed to be his birthday and he goes to a party with all his friends and he gets there and everyone is in a suit and everyone is drinking cognac and champagne. His friend calls him up and says ‘Jackie we’re in trouble, we need your help – we’re in the docks.’ So he realises he needs to help his friend, so he goes to the docks, takes off his suit, puts on a track suit, jumps around everywhere trying to find his friends, things are moving in the shadows and he wonders what’s happened to his friends - then we all come out with this big case of the advertised drink and shout ‘happy birthday Jackie!’ - it was good fun and Jackie was great. I came close to working with him a few times – what happened was once Rumble in the Bronx opened a lot of westerners wanted to work with Jackie Chan - I knew people and I was hired to work with Jackie and my rate at the time was $10,000 for the week to work with him and do a fight scene. Then there were other people calling up and knocking on the door saying ‘We’ll do it for free.’ One guy paid his own air fare, accommodation and worked for free to do the role. He had comparable skills too so they’re hardly going to pay me $10,000 when he’ll cost them nothing. There’s no unions there to protect us. It’s a shame that there’s too many people that will do this, and then what happens is Jackie ends up getting actually hit by these guys – and consequently he doesn’t want to work with westerners anymore. The whole problem is avoided if they hire professional people. Absolutely, because that costs time and money in the end, because shooting is held up waiting for marks or swellings to be taken care of on the ‘star’ of the film – ultimately probably costing them more, surely? Sure yeah, it’s unfortunate that two of the times I was supposed to work with Jackie were at the time they the biggest budget Asian films, and yet they can’t afford to fly me in from America to do the scenes. That’s really unlucky for you Darren, and ultimately for them, still things came good with Ip Man 2. Yeah, they flew me first class, gave me first class accommodation, my own translator, my own driver, an assistant, they really went full out and treated me like a Hollywood star. Well you are becoming a Hollywood star Darren, the way things are going, you’re working on Mission Impossible III: Ghost Protocol now, aren’t you? Now here’s the unfortunate thing, you see some times you get offered things and this came through to my stunt co-ordinator who said ‘How do you fancy a couple of days fighting Tom Cruise?’ and I said ‘marvellous, yeah, absolutely – sign me up’. Then I got there and I don’t have a script and they won’t let anybody have a script because it’s top secret. So they have me as a bodyguard to this main bad girl. I’m still not allowed to be given a script to know what’s going on in the scene because it’s all top secret, no one’s allowed to know. Then Tom Cruise decides that of the three bodyguards he doesn’t want to fight me, he wants to fight the other two. They wanted me to fight with Jeremy Renner (The Hurt Locker, The Town) and then it’s a quick fight with me and Jeremy Renner, it’s unfortunate you know. I did Red Riding Hood as well. Yeah, my role in the movie was playing one of Gary Oldman’s werewolf hunters, I have a dialogue scene with Gary and then I fight with a werewolf. Yeah but they kept cutting the budget. They cut my dialogue out and then instead of this big fight with the werewolf they just had the werewolf kill me right away really quickly! Yeah literally! They kept cutting the budget. Unless you’re a named actor and need to be in the movie because you are a star – then you’re expendable – I’ve been cut out of many films, that’s the unfortunate side of the business. Yeah, that’s part of the business and really frustrating, I’ve had the same thing happen myself. It’s still a large amount of money, I mean I only did like four days on Mission Impossible and I could literally live a year on the money they gave me – you take the good with the bad. You were in Watchmen as well – I love that film – were you fighting with Rorschach in that one? No, I was one of the SWAT guys that would go up to watch Rorschach’s apartment just before he comes out with the match and the spray that he turns into a flamethrower. It was me and another member of the SWAT team, we had this dialogue where we were all scared about goin up to the apartment to confront him – you know ‘I’ve heard about this guy and he’s crazy!’ that kind of stuff. But they cut it out because it was kind of a bit funny and it didn’t fit the intensity of the scene – so it was cut. Working as a stunt man in Hollywood as well as acting, that must be a real bonus yeah? Yeah friends of mine were stunt co-ordinators on some of the bigger movies and they said to me, listen if you want to do some stunt work with us you’re gonna make a lot of money. When you’re a struggling actor that’s tempting and it takes away the stress of having to find work and my acting at the time wasn’t really taking off, so I spent two years just doing stunts. Which films did you work on? I worked for instance on 300 for three months. We were getting cheques every week that were like – wow – crazy money, I mean I made more money on 300 for three months doing stunts than I made in fifteen years as an actor. So that movie, then Night at the Museum 1 and 2, The Chronicles of Riddick, Blade 3 – I also doubled for Ray Liotta for his fight scenes with Jason Statham in In The Name of The King - I did those movies so I could put money in the bank and afford to be an actor again. Yeah that kind of financial cushion can help you push your career again. I could then afford to pick and choose a little more, turn down roles that I felt wouldn’t advance me, and accept the ones that would – that approach helped get me Ip Man 2. I could then take two months off in the run up to the film and dedicate my time to training for it and not have to worry about any finances. You had to take your weight down for that part didn’t you? Yeah I was bigger at the time I was offered it, I looked really big in the movie but actually in that movie I’m about fifteen pound lighter than I am now. The way Sammo shot it with the angles and the lenses he used it made me look huge. Yeah you looked massive. And hey – you were fighting with Sammo Hung man, Hollywood legend the guy that fought Bruce Lee at the beginning of Enter The Dragon – that’s another dream come true, surely? Yeah. The first movie I saw was Enter the Dragon and there’s Bruce Lee and Sammo at the beginning of that movie. I mean so many of your dreams must have come true working on that movie – and the way it’s set up – tell me, there’s gong to be an Ip Man 3 isn’t there? There’s got to be – I mean we have Bruce Lee popping up at the end of the movie there. See, now here’s a thing. Number one there was some issues with Bruce Lee’s estate us having that scene in there, and Donnie right now is not too keen on the idea because there’s Ip Man 1, Ip Man 2, there’s a prequel called The Legend is Born with another actor playing a young Ip Man. Then they’re planning a TV series of Ip Man, there’s another Ip Man movie in development called The Grand Master – so Donnie thinks there’s too much Ip Man stuff going on right now and they’re all jumping on the band wagon. So if it happens it might be quite a bit from now when Donnie’s older and looks more the age Ip Man was when he trained Bruce – I think it will be a while before we see an Ip Man 3. Are you based in Van Couver Darren? Yeah between here and LA, I have to be in LA for the auditions. I was thinking about moving back to London for a while, but it’s tough, there’s not too many action movies being made there. There’s a lot of action stuff being made here, I’ve got to be in LA for the good roles, the lead roles because here in Van Couver you just audition for the smaller parts and that’s it. So what’s next? What’s on the slate? Well after Ip Man 2 I did a film with Steven Segal called Born to Raise Hell , it’s out on DVD now in England, then I did Aladdin: Curse of the Djinn that will be on SCYFI in April/May. I’ve just finished a movie with Stone Cold Steve Austin and Michael Jai White called Hangar 14. That’s the one where you’re part of a military training group on an exercise that end up trapped in a warehouse with a load of maniacs and you’ve only got blanks – good experience on that? Yeah, it was a character like I’d never played before, I got a chance to ham it up a little bit. It was a different kind of movie for me, certainly a different type of character, look forward to that one. I’ve just signed a deal with Warner Brothers for a big martial arts movie, very big, but I’m not allowed to talk about it yet! Tell you what Joe, as soon as the press release is out I’ll give you a shout and tell you what it’s about. I’ve just signed a deal with Warner Brothers for a big martial arts movie, very big, but I’m not allowed to talk about it yet! Fair enough, look forward to hearing about that one. Have you got any ambitions to direct films Darren? I have yeah, I am going to direct as soon as Red make the Scarlett camera available I’m going to start shooting stuff for it. I’m going to go and do some stuff in Hong Kong , L.A., London – but I’m really waiting to get my hands on that camera, I don’t really want to do it with the Canon 5D’s or or 7D’s, I want to use the Scarlet to see what it looks like. I’ve got three different producers involved that own Red 1’s, I want the Scarlet to be able to cover the action stuff. I’ll do some tests with it. I was hoping to have started by last year, I wrote a script that was kind of born out of my frustration of not getting offered any good roles. As soon as I came up with the idea I started getting offered great roles! Well, you’ve got to make hay while the sun shines mate, yeah? Mind you with the different experiences you’ve had working around the world you’ll know great locations, crews and actors, right? Yeah, what I thought was how can I make a movie where I can call in as many favours as I can to shoot one movie? I thought I could shoot two weeks in Hong Kong, two weeks in London, two weeks in L.A. then shoot some bits in Van Couver. I could utilise different locations and different people I’ve worked with all over the world, I mean I’ve been doing this 20 years so I know enough people, so I could sort of patchwork everything together, so we shall see, the script is being written around – well you’ll know this as a writer Joe – written around what and who is available. Absolutely yeah, write to suit your pocket as well, yeah? Wait, how do I get hold of Diary of a Bad Lad? I think it’s available on a few websites over there? There’s also about 5 million illegal download links on the net! Ha! I’ll have a look on the legal ones! I’ll look on Net Flix, I think that’s where I saw it. Listen if you can’t get it I’ll bloody well send you a copy! (Joe) Great talking to you Darren, and all the very best in everything you do mate, you’re an inspiration to so many over here mate. So the Bad lad met Twister, and found Darren Shahlavi to be one very down to Earth action star, and if anyone is an inspiration to any aspiring young martial artists out there who want to make it in movies, then Darren Shahlavi is that man; a passionate and determined man blazing a trail in action movies. Power to your creative (and hard!) elbows Darren.